Nestled in the challenging mountainous terrain of Babcock State Park in the center of southern West Virginia, the Babcock Gristmill Grinder Half Marathon trail run more than lives up to its name, offering runners a rugged course along single- and double-track trails in the heart of the state’s whitewater rafting country. The race, which has grown from a field of about 40 runners at its first race to nearly 300 every year today, also features spectacular overlook views as you run through the mountains, as well as plenty of lush green vegetation and waterfalls along the way. 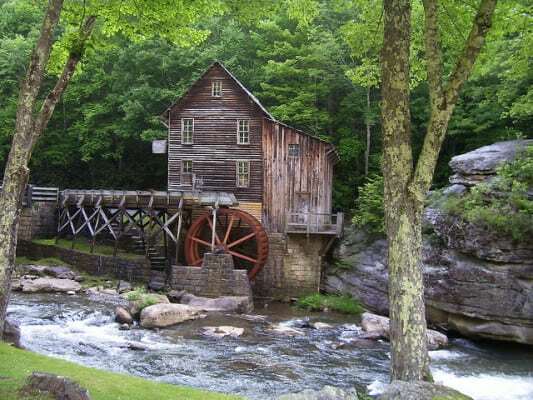 Part of a state-wide race series known as the West Virginia Mountain Trail Series, the Gristmill Grinder is the series’ first race of the year, and starts and finishes at the Sugar Camp Run Picnic Area on the southern edge of the park. From there, the course winds through Babcock’s hills, valleys and mountain ridges, takes steep climbs up to the area known as the “Skyline” along the cliffs, and then evens out somewhat along the rolling terrain up along the cliffs. The steepest climbs and descents occur in the early and late parts of the race, between miles 2 and 3 and then again around the 10-mile marker, race organizers say. There’s also everything you might expect from a trail race along the way — rocky and muddy terrain, with streams and water interspersed throughout the course. There are also three aid stations along the route, and a gradual uphill to the finish line. Thanks in part to its remote location and rugged terrain, the race is a small one, and saw more than 260 runners cross the finish line in the half marathon in each of the past few years. For runners, the half marathon race begins at 10:00 AM, while the 5K for walkers starts at 10:10 AM. Runners thinking of taking part in the race are encouraged to sign up early, as the race will limit the number of entrants to 280, and no registration will be available on the day of the race. Located among the mountains of southern West Virginia, about 64 miles southeast of the state capital Charleston and roughly 120 miles northwest of Roanoke, Va., Babcock State Park typically sees cool to mild weather in April, a month that has brought record temperatures as low as 8 degrees (in 1923) and as high as 87 degrees (in 1949). On race day (April 20), the average low is 41ºF and the average high is 63ºF. See the race route map for the Gristmill Grinder Half Marathon here. To reserve your spot in the spring 2019 running of Babcock State Park’s Gristmill Grinder Half Marathon or 5K, register online at Active.com here. Ever run in the Gristmill Grinder Half Marathon? Share your impressions here, or post your review in the Comments below.